Turf laying is very simple and in most cases should not require an expert. 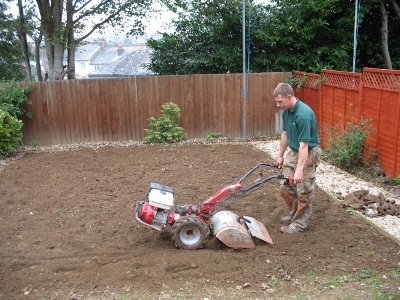 The most important job when laying a new lawn is to prepare the ground properly before the turf is delivered. Start by breaking up the soil to a fine crumbly tilth. The easiest way to do this is to hire a rotovator from your local hire shop. If you have a small garden, you may decide to break up the soil by hand... You can do this with a spade or fork and then scrub over any lumps with a firm rake to finish crumbling the soil. Once the soil is crumbled in to a fine tilth, rake the soil as level as possible. A wide rake (generally known as a landscapers rake will make the job far easier. You will then need to tread the soil in to firm it down. You don't need to overlap your footprints as a little loose soil will be useful for the next stage. Now you have a firm level soil area with allot of footprints. If you can see any obvious high areas or lumps, use a rake to scrub them off and the spread any excess soil around or fill any hollows you can see. If you see a hollow or sunken area but no lumps, you will need to rake the whole area so you take an even amount of soil and spread this soil in to your hollow. If you have filled a hollow, you will need to tread in that area again. Rake over the area again for the final time. 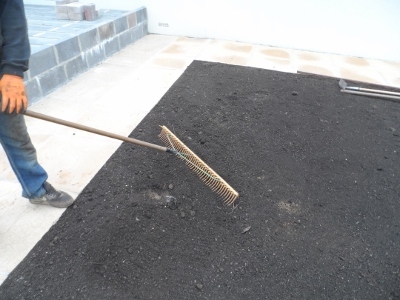 This time you can use the back of the rake or a straight edge to screed the soil. 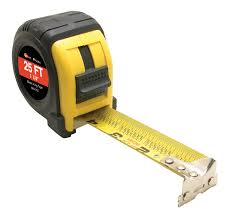 If your lawn is rectangular, measure the length and width in Metres. Make sure the measurement is not slightly wider at one end or you may run short. If the area is an odd shape, section of areas using pegs and measure each area individually and then add them together to give you a final tally. Remember to order enough turf so you have a little extra for any cuts you may need to make. It is usually quite cheap to add a few extra rolls to your order but if you don't order enough, an additional delivery could be expensive. Turf Lawns deliver throughout England and Wales from Tuesday to Friday. You can place your order online or call us on 0844 443 07 09. 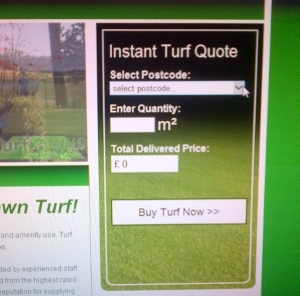 We do offer Am deliveries so if you wish to lay the turf on the day of delivery, the AM option would be best. The turf should be laid as soon as possible after delivery. The shelf life will depend on the temperature. If the weather is very hot, the turf should be laid very quickly. In cold conditions, the turf will last for a few days. Start by unrolling your 1st roll along the longest straight edge of the garden. If you have curved edges, you can lay a straight row of turf through the middle of the garden. Make sure you fully unroll each turf. Take the second roll and partly unroll it.... slide it up against the end of the first roll making sure that the ends are tightly butted up to each other but not overlapping. Continue laying each roll in the same way and when you get to the end of your 1st row, use a sharp knife or spade to cut off the end as required. If you find that you need a tiny bit of turf to finish your row, slide the previous full roll to the end and add a smaller piece in between the last roll and the one before it. Its always better to have any small bits in the middle of the area rather than on the edge. Once you have laid your 1st row, lay half a roll to start your second row. At this point you should lay boards or planks along your 1st row so that you are not walking directly on top of the laid turf. Continue to lay the turf, butting the ends as well as the edges together but never overlapping. Roll you boards or planks over so they are always on the previous row of turf. Reuse any offcuts that you can to minimise waste. When you get to the edge of the garden, you can use your sharp knife or spade to trim your desired edge but remember that if you only need a very thin strip to finish, you should slide out the previous turf and add the this strip in between the full rolls. The most important thing to do once your lawn is laid is to WATER WATER WATER. Ok, so you may not need to water to much in the middle of winter of if there is persistent rain but in the Spring, Summer and Autumn, you should be thoroughly watering the turf. There is no set guidance as to how long to water your turf as it will vary with temperature, wind, sunshine and depend on how dry your ground is to start with. Base your watering on the need for the water to significantly penetrate the turf and in to the soil below the turf. The turf should be watered with a sprinkler of hose with a sprinkler/spray nozzle. Never jet the water at the turf, you don't want the water flattening the grass or it will be more easily burnt by the sun. Water twice a day, early morning and late afternoon and in to the evening. if the weather is very hot, you may need to water through the day. Although watering in hot sunshine can burn the grass, it is better than the turf drying out and the grass will recover from any burning effect. PH is the measure of the acidity of your soil. For a healthy lawn, the PH should be between 6 and 7. Slightly acidic to Neutral. If the PH is outside of this guidance, the nutrients in the soil will not become available to the lawn so easily and can also cause lawn disease and moss. DIY PH metres or testing kits are widely available from garden centres or online. Take soil from 3-4 inches below the surface for an accurate measurement. If your soil is very acidic (below 6) you can apply a granular lime to raise the alkali level. If your soil is very alkali, you can add an acidic supplement such as sulphur to reduce the PH level. It is important to check the PH level before fertilising because if the PH is not right, the nutrients in your fertiliser will not become fully available to your grass. A lawn fertiliser should be applied to your lawn 3 or 4 times through the growing season. Fertiliser contains a mixture of Nitrogen, Phosphate and Potassium: N.P.K. and Autumn or pre-winter fertilisers can contain other ingredients such as Iron and Sulphur. N. Nitrogen: A good quality turf will use a reasonable quantity of Nitrogen, It is the main fertiliser associated with the growth of the grass and will also give your lawn a lush green colour. A nitrogen rich fertiliser can be applied in the spring to give your lawn a kick start for the growing season but be careful not to apply to much at once or you will be spending allot of time mowing. if your garden is looking very pale and the grass is not standing up straight, it may be in need of some Nitrogen. Nitrogen should not be used in any quantity at the end of the growing season. If you use to much Nitrogen, the more predominant grasses with take over the lawn and the fine fescue that makes the lawn look dense will be reduced. P. Phosphate: Phosphate is the key ingredient for good root growth. Although you will probably never see the roots of your grass, the roots are very important because they will draw on other nutrients in the soil and also the moisture deep in the soil when there is none available in dry weather. Good roots will also help the lawn to drain when the weather is very wet. K. Potassium. Potassium is key to keeping your lawn healthy, it will help to keep the grass green without to much growth and is especially important in the Autumn so that your lawn maintains good health throughout the winter. Fe. Iron: Iron is important for helping photosynthesis and although it is not part of the chlorophyll it is essential for chlorophyll synthesis. If your lawn is yellowing or the grass has yellow tips it may be deficient of Iron and suffering from chlorosis. Iron can be applied throughout the year providing temperatures are above 8 degrees C. and liquid iron will work within 2 or 3 days. Iron will give your lawn a lovely dark green look and it will harden the grass and help to protect against lawn diseases however to much iron can cause the grass to look dark grey in colour. A vital part of keeping your lawn looking great is regular mowing, correct mowing height and mower maintenance. Mowing should be carried out throughout the growing season and even occasionally in winter if the weather is mild and the grass is growing. You should never mow more than 1/3 of the grass height in one cut and you should leave 48hrs in between each mow. It is really important to keep your mower well serviced and make sure that your blade is sharp. Rotary mowers are best for mowing lawns for their ease of use and minimal maintenance but we would recommend making sure the mower you buy is powerful for its size and it collects the grass clippings. We would also recommend a mower with wheels or roller rather than a hover mower as the mowers with wheels or a roller should have more uplift to lift the grass up straight as its cut. Cylinder mowers may be a preferred choice if you want an ornamental lawn but bare in mind that you will need to have a cylinder mower professionally serviced each year and this will probably include a cylinder and bottom blade regrind which can be costly. You will also need to make sure that you become familiar with the cylinder adjustment because its really important to make sure your cylinder is adjusted to the bottom blade evenly from side to side for the perfect scissor action. This has to be done on a regular basis to compensate for the wear in the cylinder and bottom blade. Mowing height is very important. We would advise mowing your lawn on a medium setting or around 35-45mm. If the weather turns very hot, very tightly cut grass will suffer far more than grass that is mowed on a slightly higher setting. On the other hand, if you don't mow the grass short enough, the more predominant grasses will overtake the lawn and the finer grass (fescue) that make the lawn look dense will disappear. If you want to reduce the height of the grass, you should do this in the spring or autumn a little at a time. Many home owners will have never heard of lawn disease but it is quite a common problem. All of Turf Lawns turf is treated and protected against disease however, any protection will only last about 6 months. Lawn disease is most common when the turf is damaged, under stress or under or over fertilised. The most common weather conditions are when its mild and consistently wet and murky, typically in the autumn. The stress and damage that can lead to lawn disease can include mowing with a blunt mower, irregular mowing, heavy traffic, over fertilising, weed killing (especially if the lawn is lacking in nutrients), leaving grass clippings on the lawn. Red Thread: The most common lawn disease is called red thread. Red thread can be identified by its pink appearance especially on damp mornings when there is a due. It will appear in small patches, generally 1-6 inches in diameter. Red thread is generally caused by a lack of nitrogen as well as previously mentioned stress and mild murky weather. Red thread does not cause permanent damage but it should be treated straight away. The first combat against red thread is to fertilise with a fast acting nitrogen based fertiliser. If you have been using lots of nitrogen fertiliser already, it may be a sign that you are over fertilising. If there are still signs of the red thread after 10 days of fertilising then you can treat with a chlorothalonil based product.